PHE says patients have "a part to play" in stopping the rise of infections. Antibiotics are vital in cases of sepsis, pneumonia, bacterial meningitis and other severe infections. But PHE says antibiotics are not essential for every illness. Prof Paul Cosford, medical director at PHE, told the BBC: "We don't often need antibiotics for common conditions. "The majority of us will get infections from time to time and will recover because of our own immunity." He said patients should not go to their doctor "expecting an antibiotic". 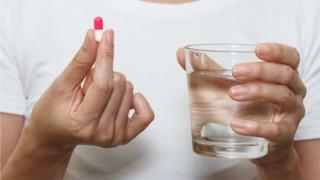 Prof Cosford said: "A doctor will be able to tell you when an antibiotic is really necessary. "The fact is if you take an antibiotic when you don't need it then you're more likely to have an infection that the antibiotics don't work for over the coming months." The Keep Antibiotics Working campaign will also see patients handed leaflets explaining how long it normally takes to recover and the warning signs of serious illness. Bacteria are incredibly cunning - once you start attacking them with antibiotics, they find ways of surviving. People have died from bugs resistant to all antibiotics. England's chief medical officer, Prof Dame Sally Davies, has already warned of a "post-antibiotic apocalypse". If the drugs fail, then not only do infections become harder to treat, but common medical procedures such as caesarean sections and cancer treatments could become too risky. The most serious drug-resistant infections are sent to PHE's laboratories at Colindale, north London, for analysis. Prof Neil Woodford, the site's head of antimicrobial resistance, said the most potent antibiotics, like carbapenems, were failing more often. He told the BBC: "If we go back to 2005/07, we were seeing these bacteria in maybe two to four cases per year. "Last year we confirmed these resistant bacteria in over 2,000 cases."